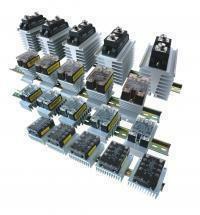 Our voltage control device is the regulation module of adjust resistance type. Established in 1992, Wuxi Gold Control Technology Co., Ltd is a reputable high-tech manufactory specialized in the research and production of SCR single-phase and three phase AC control, using national patent cooling duct and insulation terminals design. With compact structure and appearance, clear working instruction, and convenient installation, we provide you reliable, simple, and professional wiring work. Wuxi Gold can produce the control device according to your requirement as well. The comprehesive application of it is the cabinet including control circuit, power module, protection circuit, and radiation in whole. Voltage regulator has the characteristic of compact structure, prominent function, convenient use, and excellent performance. Owing to the stringent quality management, our voltage control has been commonly used in the electric heating fields recent years. Other than quality assurance, our products are with favourable price, good service, and timely delivery. Interested? Find out in our showroom for more fine products right away! Favourable price, good service, timely delivery, quality assurance, packaging ssr, relay, solid state relay, component. Load voltage: 0-220 vdc, 0-380 vdc. Current ratings:10A 20A 25A 40A 60A 80A. Adjusting resistance of voltage control:470k 680k. Link bet. In&out: the input and output of products is not isolated, pls choose insulated good potential and knob to prevent shock! Output: zero switching, random switching. Electrical Equipment & Supplies>> Relays. Place of Origin: Jiangsu, China(Mainland). Model Number: 5A, 10A, 20A, Purpose. High quality Solid State Relay. With UL approval, CE, CUL, RoHS certificate.